Rich in antioxidants, dried or fresh figs are delicious, healthy fruit and a natural ingredient for your skin care. Dried figs are superior to the fresh ones when it comes to antioxidants, but only fresh figs you can use topically. As a good source of omega 3 fatty acids, figs are excellent moisturizers and natural way to treat cracked and dry lips. Figs are also beneficial for skin conditions like inflammations, pimples, acne, eczema and psoriasis. This natural exfoliating agent is good way to get an even toned skin and to effectively remove dead skin cells. If you want to get silky and smooth hair and to boost your hair’s health in a dramatic way we suggest you to use one of the most popular natural ingredients used in the hair care industry, the figs, because artificial hair beauty products often fail to give the desired results and have undesired side effects. Several studies have found that fig leaves have an antioxidative and anti-collagenase effect on wrinkles. These anti-wrinkle benefits associated with figs have ability to reduce the percentage of wrinkle depth and length. Latex from the fig tree branches is a natural and highly effective wart remedy without side effects. According to comparative studies, the fig tree sap mechanism to remove warts is the result of the proteolytic activity of the fig milk enzymes. It is important to get rid of the dead skin cells, because they make our skin look dull and lifeless. 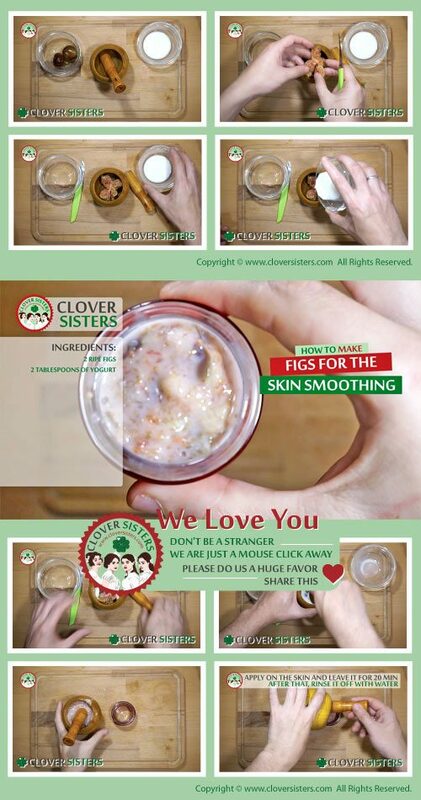 One of the best ways to do it naturally is to use figs to make an excellent exfoliation mask. This excellent skin exfoliator contains several active enzymes which also help protect the skin against free radical damage. Make the puree of 2 ripe figs and 2 tablespoons of yogurt. Apply on the skin and leave it for about 20 minutes. After that, rinse it off with lukewarm water. Don’t forget to share and take a look at the previous page of this post if you haven’t already or some of our other posts and recipes. Thank you.